Monarchs from eastern North America winter each year en masse at a number (12+) of mountain-top locations in central Mexico, beginning in November and typically lasting through March. 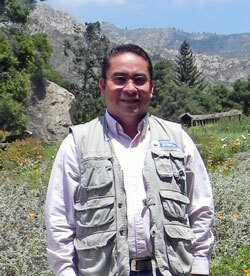 During this time, the staff of the monarch program at WWF-Mexico conducts field surveys of the size of these colonies. By mapping the outer perimeter of the colonies, the amount of surface area occupied by monarchs is determined for each colony. Typically, the 'size' of the overwintering population is then assessed by summing the areas for all colonies (see graph below). While this method may seem crude, scientists have found it is extremely difficult to estimate actual monarch numbers at the colonies, because of their overwhelming abundance. Assessing the surface area has therefore been one of the simplest ways to track the wintering population. 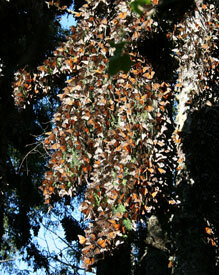 The overwintering locations in Mexico have been called the 'achilles heel' of the eastern monarch population, since the vast majority of the population spends up to four months in these mountain refuges and during this time they are often threatened by severe storms which can cause massive mortality. 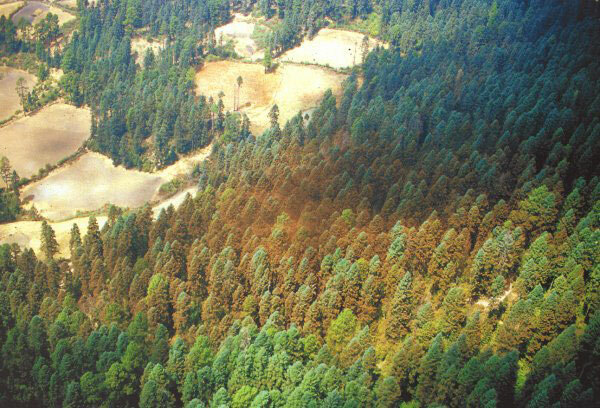 Further, dispite the area being an official protected area, clandestine, illegal logging of the fir trees at the sites has reduced the available habitat for wintering colonies over the years. As such, the health of the entire population east of the Rocky Mountains hinges upon successful wintering at these sites. Protocol Notes: During the overwintering season, colonies are located biweekly and the area they cover are mapped, digitized and the area covered is calculated. The biweekly counts started in 2005. Before that, colony surveys were only performed once per year (at the beginning of the season).